The generational shift to the Cloud/AI Era has several important hallmarks: 1. The Cloud – Hyperscale datacenters with 10x lower costs and effectively limitless scale taking computing tasks from devices and private facilities. 2. 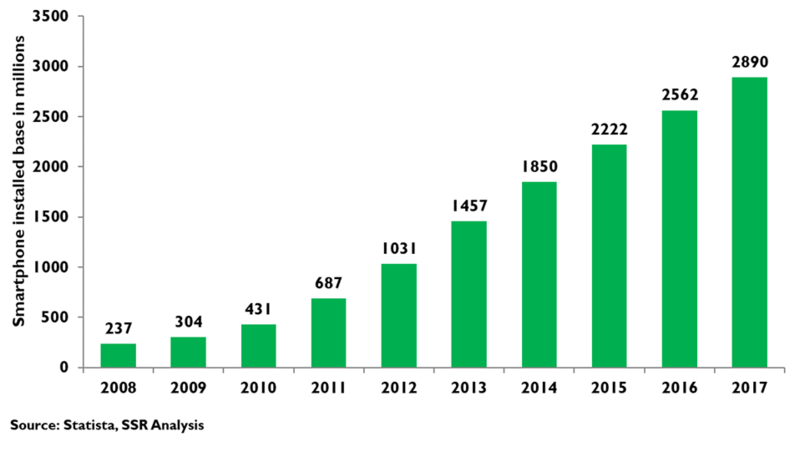 Massive Reach – 3B smartphone users served by continually improving wireless networks generating mountains of data. 3. 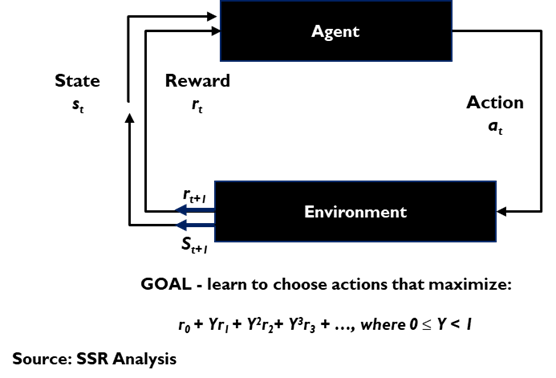 AI – A radical programming tool that can make any software better and enable entirely new use cases. 4. Complementary Developments- Other emerging tech that extend the value of the cloud/AI paradigm and enable new applications. This era is marked by huge economies of scale, first mover advantages, network effects and scarcity of talent that have yielded powerful platform players, each with ecosystem partners, vying for enormous disruptive opportunities. The media, advertising, retail, consumer tech, and enterprise IT industries have already been disrupted, and the inevitable effects will be comprehensive with time. Regulation and resistance will delay, but not deter, disruptive threats to the transportation, financial services, healthcare, and other industries, as the Cloud/AI era enables radically new and better solutions. Barriers may take longer to breach than the attackers expect, but once breached, the impact will be greater than the incumbents fear. 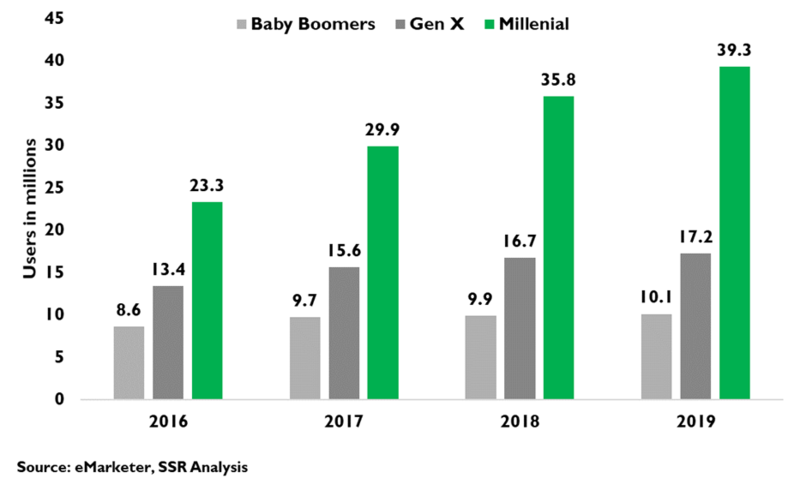 Eventually, there will be another generational shift, driven by tech still in early development, that will disrupt the order being created by this era. 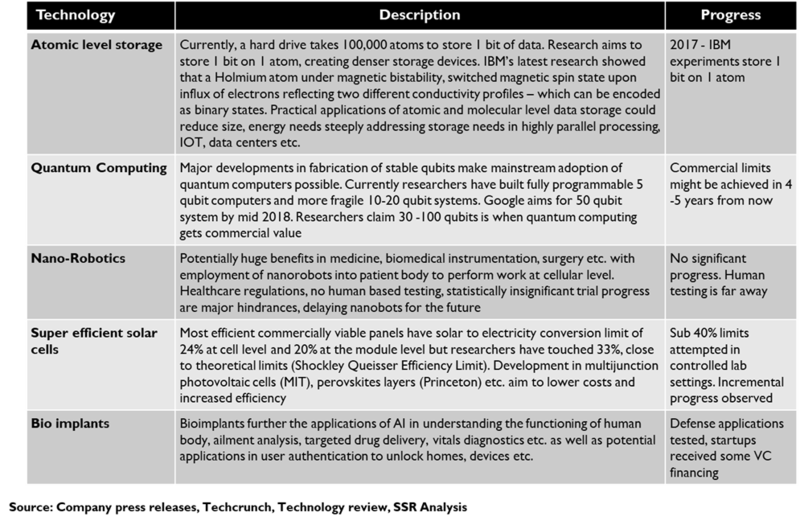 Interesting candidates include quantum computing, atomic level storage, nano-bots, superefficient solar cells, bio-implants, and others, but only time will tell which will yield the megacaps of the next era. The PC Era has given way to the Cloud/AI Era. Every few decades, innovation presses the limits of the prevailing TMT paradigms. In the ‘80’s, the PC Era supplanted the Mainframe Era. Now, hyperscale datacenters, smartphone proliferation, wireless network evolution, massive datasets, and AI-infused software have yielded huge cloud platforms and disrupted major industries (i.e. media, advertising, retail, consumer tech, enterprise IT). As enterprises invest to adapt existing datasets to the needs of AI, as new datasets are generated, as regulatory barriers weaken, and as complementary technologies (5G, blockchain, AR optics, etc.) come to market, new and expanded commercial uses will become manifest. The Cloud/AI Era favors big platforms. Hyperscale datacenters have enormous economies of scale, with costs a magnitude lower than typical enterprise datacenters, and several magnitudes lower than the smartphone in your pocket. The franchise services riding atop them have powerful first mover and network effects that stymie would-be competition. Leading edge AI requires tuned computing resources, massive data sets and, most importantly, scarce experienced engineering talent, that further advantage the big cloud names. These companies, with ecosystem partners, will be at the center of the most disruptive shifts to come in this generation. Many traditional businesses will be disrupted. Cloud/AI era innovations have already dislocated the traditional media, advertising, retail, consumer electronics and enterprise IT industries, tapping multi-$T markets and fueling the expansion of the big platforms. Change will be irreversible and comprehensive. Other industries have remained insulated by poorly organized datasets, market fragmentation, and regulation. These barriers are not impermeable, and we expect incursion into transportation, financial services, healthcare, and other industries to be apparent over the next 5-7 years and decisive longer term. Opportunities abound. The cloud/AI platform leaders are largely settled – GOOGL, AMZN and MSFT are positioned against the biggest opportunities, but BIDU, BABA, Tencent, FB, AAPL, CRM, IBM will also play important platform roles. For this group, competition is largely amongst themselves and legal and regulatory actions, particularly by the EU, are the biggest threats. A population of suppliers and partners will coexist and some will thrive. AI-as-a-Service, offered from the major platforms, will allow 3rd parties an easier path to new AI-enhanced application with industry vertical solutions the most intriguing opportunities. Emerging innovations – e.g. autonomous control systems, augmented reality, predictive analytics, natural/intuitive UIs, blockchain, etc. – will involve platform leaders but open significant opportunities for new players playing many roles. By 2027. 1. AI virtual assistance has displaced the ‘App” model as the primary UI. 2. The exodus of enterprise computing to the public cloud is in full swing. 3. Enterprise application SW market has consolidated to a few AI-rich SaaS platforms. 4. 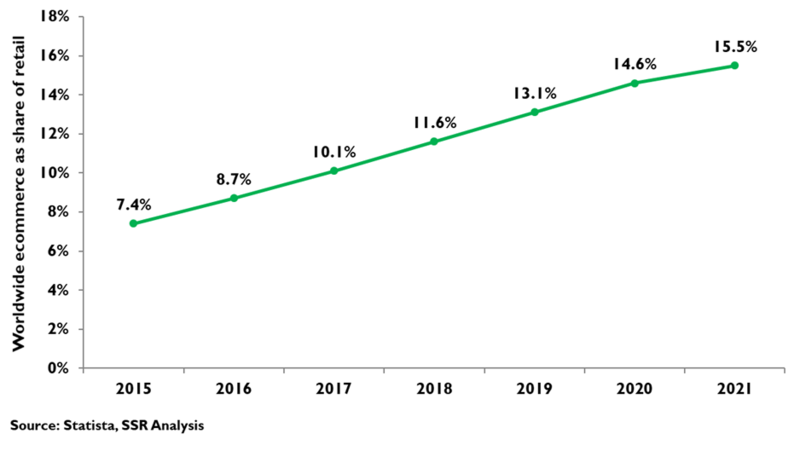 Digital advertising takes the majority of global ad spend but growth has slowed. 5. E-commerce is still a juggernaut, taking share in both wholesale and retail markets and redefining the role of physical retail. 6. Fully autonomous TaaS is available in many urban/suburban markets, with substantial momentum for further expansion. 7. Dramatic advances in fraud prevention via AI, biometrics, and blockchain have begun to disrupt basic consumer banking. 8. Handsfree AR is well established in industrial use cases with the tech needed for attractive consumer solutions just becoming viable. 9. AI powered healthcare solutions has risen in emerging markets, establishing valuable use cases that are slowly being absorbed by developed countries. 10. GOOGL, AMZN and MSFT are the most valuable companies in the world. The next, next era. There will be another innovation driven tectonic shift, probably sometime after 2030, to disrupt the business models being created today. The seeds for that change may already be in development laboratories – technologies like quantum computing, atomic-level storage, nano-bots, bio-implants, superefficient solar cells, and unsupervised machine learning are drawing investment many years ahead of their practical commercial application. It is likely that some of the most important innovations are not yet obvious, with inspiration to come as we absorb what this current era will bring. 8 tenets for investing in the Cloud/AI era. We believe the next 10 years will see steady progress toward the scenario that we have outlined, yielding clear opportunities for investors. We recommend the following strategy: 1. Trust the top platforms; 2. Ride franchises; 3. Expect consolidation; 4. Look for complementary tech; 5. Consider ecosystem partners; 6. Incumbents only if they challenge the status quo; 7. Be sure about new entrants; 8. Watch out for the government. We will expand upon these ideas in the body of this piece. We are amid a generational shift in the paradigms for the way people and organizations use information. 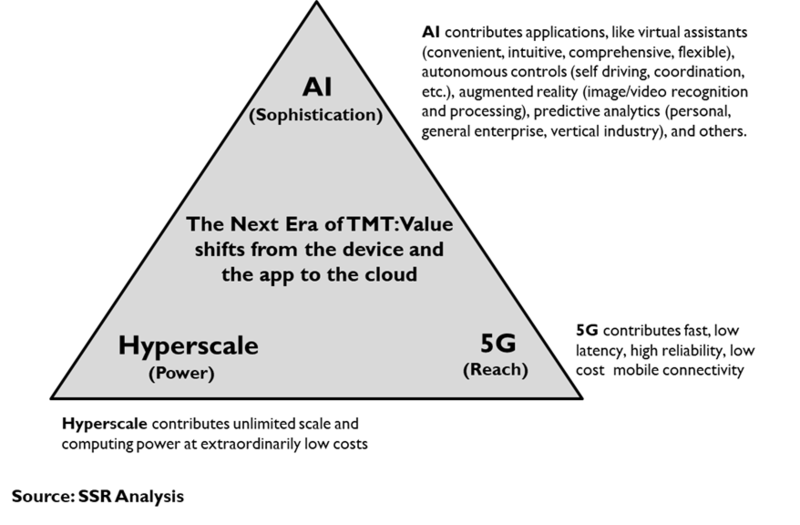 This sea-change – catalyzed by the power and efficiency of the cloud, the reach to billions of users, the extraordinary capabilities of machine-learning AI, and range of complementary technologies – has been upending the PC, structured data, fixed network, and application oriented era that has dominated TMT since the ‘80’s. The impact of the new era is already evident in the rise of powerful cloud platforms (AMZN, GOOGL, MSFT, FB, CRM, etc.) supporting massive service franchises and hosting for partners. There remains considerable market runway for these companies to sustain their success. Innovations, building on the scaffolding of the new paradigm, will extend its influence into new applications and arenas. For example, block-chain and bio-metric authentication should dramatically reduce risk and friction in financial transactions. 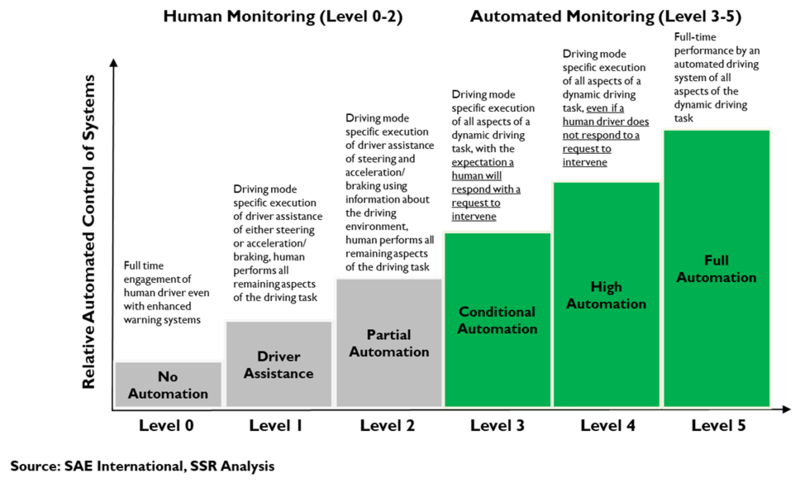 Similarly, autonomous control systems have broad reaching implications for everything from transportation to manufacturing. Augmented reality, built on AI and advancing display technology, is beginning to emerge in industrial contexts and could, eventually, displace the current device paradigm for consumers. Eerily prescient predictive analytics will power both enterprise applications and virtual assistants that will crowd out the “app model” for consumers. Within 10 years, these disruptions will have taken root, defining sea-change for major sectors of the economy. The redefinition of consumer facing businesses – e.g. retail, media, advertising, basic services – will be comprehensive, with AI virtual assistants as the primary UIs. The exodus of enterprise computing to the public cloud should be in full swing by then, with a few big platforms offering low cost/high performance hosting, along with broad portfolios of SaaS applications and specialized services. Regulation (and in some cases, the sorry state of fragmented and badly formatted industry databases) may be the last barrier for revolutions in personal transportation, consumer banking, healthcare, and other industrial verticals. Focused new entrants, those massive cloud platforms, and ecosystems of complementary partners will challenge incumbents, which may or may not rise to the competitive challenge. Longer term, there are developments like quantum computing, atomic-level storage, super-efficient solar, smart lenses, nano-bots, and extraordinary advances in material science, any or all of which could help drive the inevitable next generational change. These technologies, and others that have yet to emerge, are fascinating and may begin to play a role ahead of a revolution. Smart investors will keep close tabs. Our advice to investors as this plays out is straightforward. 1. 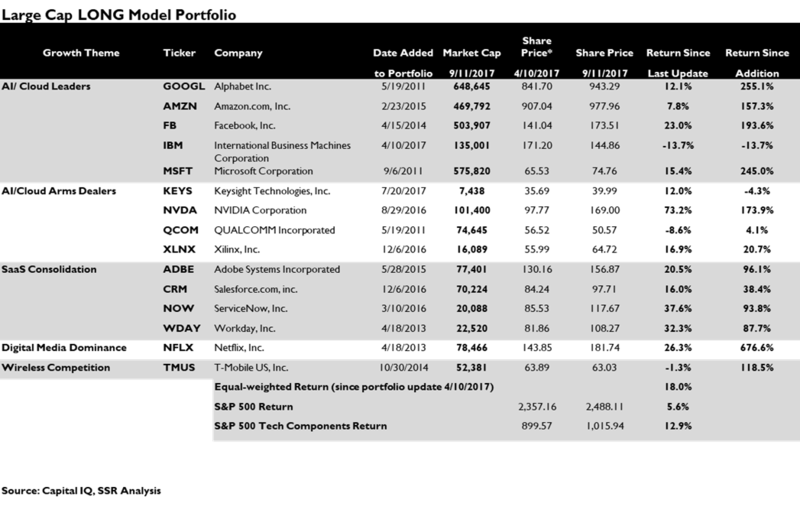 Trust the top platforms – GOOGL, AMZN, and MSFT are clear leaders; 2. Ride franchises on the right side of paradigm change – FB, NFLX, CRM, etc. ; 3. 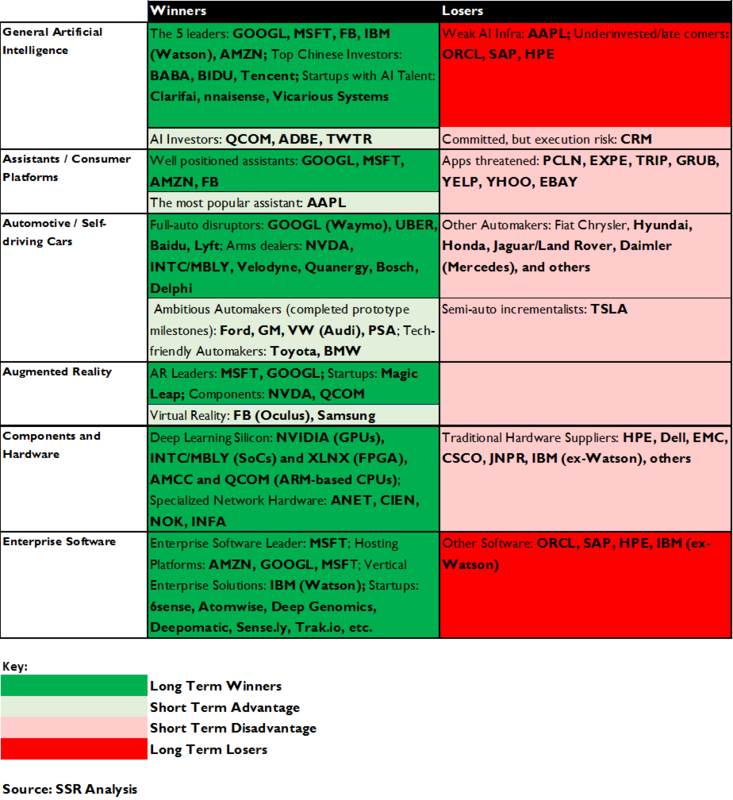 Expect consolidation – SaaS software, semiconductors, digital media, etc. will combine into bigger, broader leaders creating investment opportunity along the way; 4. Look for complementary tech – 5G, highly parallel processors, sensors, blockchain, etc. are critical support to the emerging paradigms; 5. Consider ecosystem partners – TaaS needs fleet operators, 5G needs towers and test gear, etc. ; 6. Incumbents must challenge the status quo – TMUS not T, MSFT (even, maybe, IBM) not ORCL; 7. Be sure about new entrants – The cloud/AI era puts small companies at a natural disadvantage; 8. Watch the government – Regulation and antitrust are the biggest wildcards. The PC Era was hatched in the ‘80’s, flowered in the ‘90’s and matured in the ‘00’s. The PC itself – a fragmented hobbyist’s toy in the ‘70’s and standardized into a juggernaut by IBM with its 1982 introduction – was a major catalyst, but not the only one. The AT&T break-up sent communications prices into a downward spiral. The Cable Act of 1984 freed the pioneers of that industry to multiply the channels provided to subscribers, drove massive infrastructure investment, and precipitated a major industry consolidation that remade the entertainment industry. The FCC issued the first cellular licenses in 1982, setting that industry on its long road to ubiquity. Ethernet, invented in 1973 and first commercialized in 1980, caught fire with the introduction of support over ordinary twisted pair wiring in 1987 (Exhibit 1). These building blocks yielded client/server architecture – a way to combine PC processors into more powerful clusters for datacenter servers – which, in turn, fostered the rise of structured database software. This architecture, using standardized Microsoft Windows or open UNIX operating systems, quickly began displacing proprietary mainframes and minicomputers. The transition accelerated through the ‘90’s as enterprise IT department panic over the “Y2K” problem rose to a fever pitch. On the software side, the standardization of the desktop PC and the clustered server gave developers a big platform for horizontal applications, an opportunity that Microsoft exploited to its own advantage. This environment also spawned the Internet. Connected PCs could do interesting new things, first in a workplace context, but eventually, as consumers began buying PC’s for their home, with a much broader intent. This opened the door for cable operators to upgrade their networks to support interactive broadband connections, which, in turn, inspired more bandwidth intensive consumer internet applications. Traditional voice telephony came under attack from the “triple play” (TV, broadband and voice) offered by Cable MSOs, but also from cell phone operators relentlessly extending coverage, improving service quality and reducing prices. This was the peak PC era, which led directly into the 2000 market bubble and subsequent recession. The dream that filled the internet bubble was impossible with the PC era architecture. The PC population was insufficiently large or engaged to really disrupt things the way that the most aggressive pundits envisioned. Datacenters and databases were unable to scale with the growing internet. Users were tethered to fixed connections and websites were shackled by browser architecture and cumbersome design norms. Innovation was stymied. Our theory on TMT innovation posits that the overarching paradigm creates the scaffolding for new technology to expand (Exhibit 2). While the framework is fresh, innovation works to strengthen it, but as it ages, the innovation starts to subvert its limitations, heralding the birth of a new set of paradigms. Such has been the case with the PC Era framework. Virtualization Hyperscale datacenter architecture dramatically lowered the cost of computing and removed scaling limitations. Still, much enterprise computing usage was specific to individuals and organizations with clear need to keep their activities securely separate from others. Supporting the needs of these fragmented pieces of demand while still exploiting the advantages of hyperscale architecture was a challenge. Led by pioneer VMWare, the computing industry began to adapt an old IBM mainframe technology called virtualization to create secure separation between different users on a common computing platform. Virtualization allowed enterprise IT departments to assign datacenter resources for use cases that might have previously required an expensive upgrade to individual PCs and in doing so, allowed servers to run at much higher levels of utilization. Taken on a broader scale, this concept enabled Software-as-a-Service (SaaS) applications, by which a single company might keep the activities of many customers using the same applications and servers securely separate. At its highest degree, Virtualization allowed cloud hosting operations to allocate fungible hyperscale data center resources amongst many 3rd party customers. 3G and WiFi. Meanwhile, wireless networks were getting better. First generation digital networks gave way to 2G and an explosion of texting. In 2002, carriers began rolling out 3G, which was fast enough to support internet browsing. Consumers began installing WiFi in their homes and businesses began to offer wireless connections as a courtesy to their customers. Still, internet on a handset was a major compromise vs. the PC, exacerbated by carrier insistence on controlling the internet user interface. Into this logjam came the iPhone. Smartphones. The iPhone was revolutionary. It utilized a touch screen to get past the limitations of thumb keyboards and menus. It introduced the smartphone “App” as a shortcut to services provided. Perhaps most importantly, Apple insisted on defining the user experience without compromise for the whims of wireless carriers. AT&T, which had suffered significant subscriber losses as it transitioned from its dead-end US 2G architecture to the international GSM standard, was just desperate enough to take the deal. The rest is history. 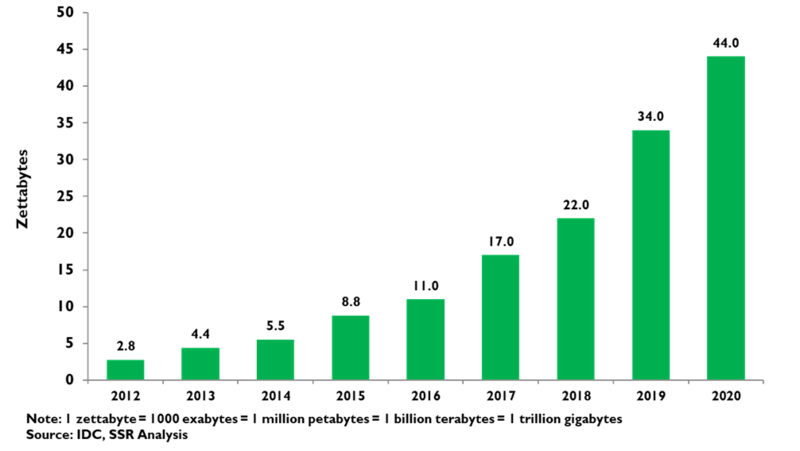 Ten years after the first iPhone sold in 2007, and with the subsequent launch of the alternative Android OS, we have a global population of more than 2 billion touchscreen smartphone users accessing those hyperscale datacenter based applications and generating almost unimaginable oceans of data (Exhibit 4). This rapid global adoption is unprecedented in the history of technology and has already brought us to the mature phase in smartphone penetration. If the smartphone and the “App” model represent a distinct era, we believe that it has a limited future from here (http://www.ssrllc.com/publication/ai-assistants-the-next-user-interface-paradigm/). AI. The combination of limitless computing and those oceans of data spurred the rise of a previously esoteric corner of computer science research into artificial intelligence. AI suffered for the limitations of the PC era. An 80’s boom in interest around a branch of AI known as expert systems had fizzled out – the solutions didn’t scale and couldn’t be adapted to new uses. The most promising branch, which focused on using iterative “learning” algorithms to mimic the way that braincells appeared to process information, was widely viewed as untenable because it required so much data and so many iterations to gain any “expertise”. Machine Learning was the province of a small population of academic zealots who didn’t care that it might never be commercially viable. Then came hyperscale datacenters and the mountains of data generated by smartphone users, and almost overnight, Machine Learning and its even more complicated variant, Deep Learning, were red hot (Exhibit 5 & 6). The early corporate leaders – Google, Microsoft and IBM – began hiring away the top scientists from universities, impairing those institutions from minting as many new Ph.Ds as the market wanted to hire. Top grads followed their mentors to those top shops, which offered a post-doc experience working on the most interesting problems with the most data on the best computing platforms in the company of the best minds in the world (Exhibit 6). Later, a few others, notably Facebook and Amazon, would buy their way in to the club, which remains a very difficult entrée. 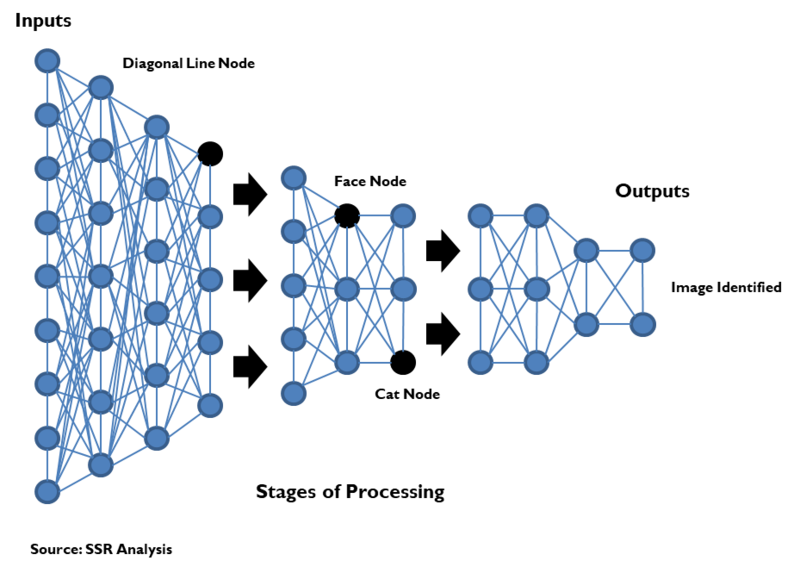 Deep learning AI allows software to generate optimized solutions in the face of seemingly ambiguous information, building a model that gets better and better with experience – the sort of thing that is natural for humans but heretofore impossible for computers (http://www.ssrllc.com/publication/a-deep-learning-primer-the-reality-may-exceed-the-hype/). This allows systems to interpret things like spoken language or photographs or videos, to make unusually accurate predictions, and adapt to situations as they change. Deep learning feeds on data – more data is better and high-quality data (well formatted, clean, well matched to the problem, etc.) is a must, as is access to a powerful computing infrastructure tuned to the parallel processing needs of training and running an AI system. We believe that there are few categories of software that AI cannot make better and many new applications that are made possible by it. 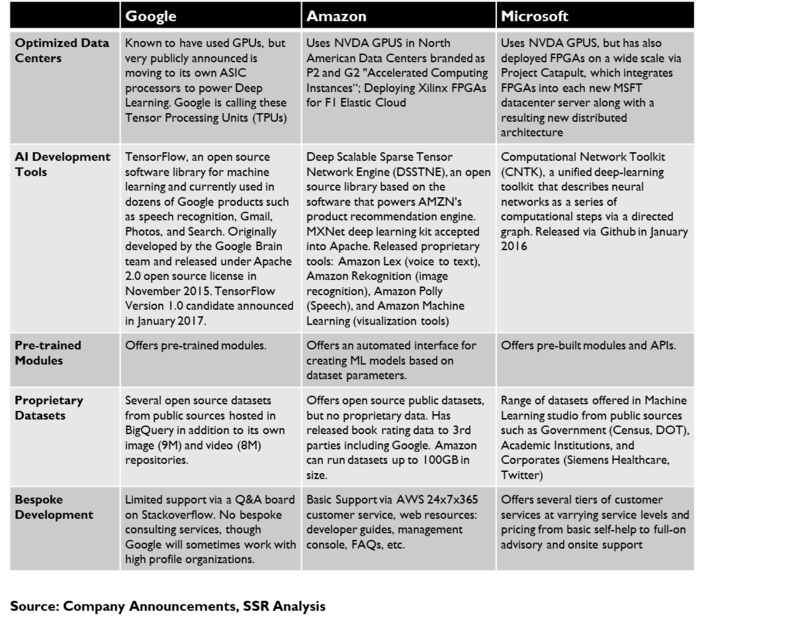 AI is already at the heart of almost every service provided by Google and Facebook, and an increasingly important factor for Microsoft and Amazon as well. As important as the Internet has been economically and socially, it is possible that AI will be even more influential as we move into the Cloud/AI era (http://www.ssrllc.com/publication/ai-sizing-the-market-big-bigger-and-biggest/). 5G. The wireless industry churns out regular revisions to its network standards, adding incremental capabilities every year or two, and stepping up with a new generation every 8 to 10. 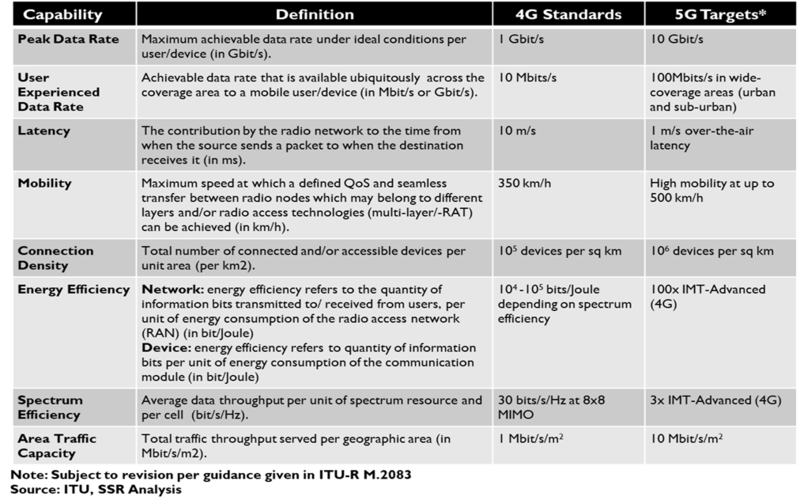 4G, deployed in the early years of this decade, had bumped up transmission speeds for users ten-fold and boosted carrier capacity. 5G will be more radical than that. The ITU’s stake in the ground asks for at least 20Gbps of capacity in each cell (20x current 4G-LTE maximums), with individual users achieving reliable 100Mbps download speeds (peaking up to 1Gbps), with maximum latency of 4ms (typical LTE networks add 60ms+). 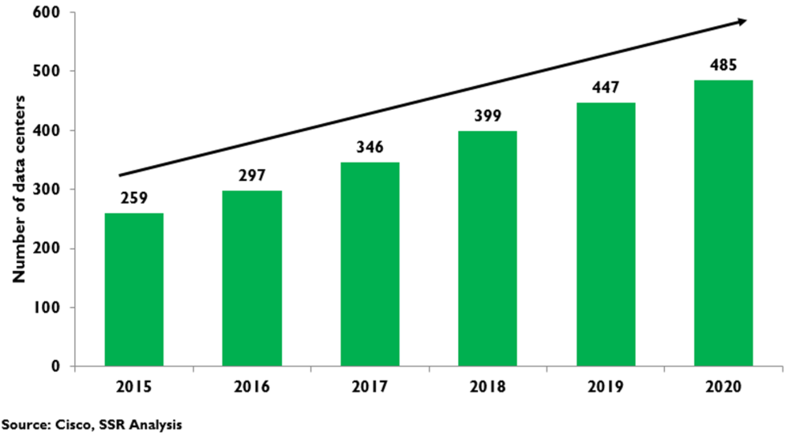 5G will also support as many as a million low throughput, low power Internet of Things connections per square kilometer over the same network infrastructure (Exhibit 8). The equipment industry is geared up to deliver pre-standard gear next year that will be upgraded to full compliance once the official standard is ratified in early 2020. We have written extensively on the development path for 5G (http://www.ssrllc.com/publication/5g-hyperscale-ai-5g-sea-change/) and our expectations that the standard will be rolled out aggressively (http://www.ssrllc.com/publication/a-5g-wireless-primer-the-final-ingredient-for-the-next-era-of-tmt/). We believe 5G will be a major catalyst for the Cloud/AI paradigm, providing widely available high speed, low latency, and low-cost connectivity for mobile users, to residential homes, amongst autonomous systems, and for the nascent “Internet of Things”. The PC Era was a radical shift away from the centralized computing paradigm of the Mainframe Era that came before it. Devices were ascendant, with datacenters re-conceptualized as “servers” intended to support the personal computing at the edge of the network. Smartphones extended the paradigm of independent devices into the pocket. Moore’s Law allowed PCs and smartphones to grow geometrically more powerful with each generation, fueling a device-centered framework for the way users would work with information. The Cloud/AI Era will see the pendulum swing back to a centralized computing dominant model (Exhibit 9). 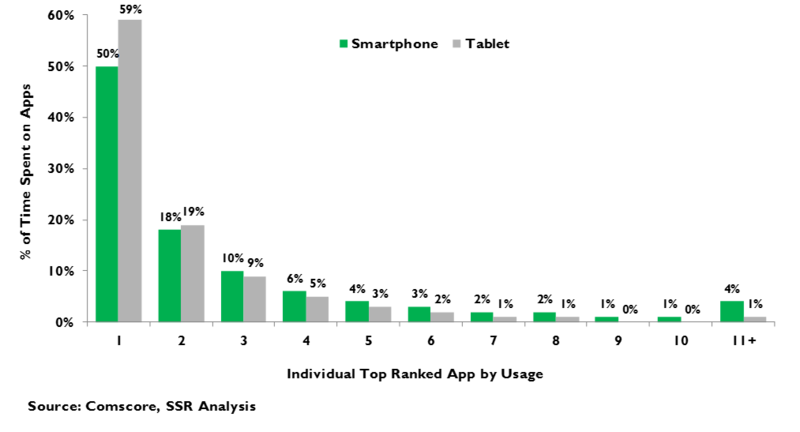 Massive scale economies and network effects mean that the biggest hyperscale datacenter platforms are also the lowest cost and the highest performance, with ready access to huge archives of personal and population-level data to drive sophisticated AI applications (http://www.ssrllc.com/publication/37440/). In contrast, the processing power and storage in a smartphone are limited and very expensive, and the AI experiences that run on them will compare very poorly. The next generation of consumer applications – natural language interfaces, smart assistants, augmented reality, etc. – will rely on cloud platforms and wireless networks, minimizing the advantages of super-premium performance specs in the devices themselves, thus promoting commoditization. The conception of the Internet as support to powerful devices will give way to the idea of devices as a convenient access point to cloud platforms as the dominant perspective. The Cloud/AI Era of sophisticated “learning” software running on cheap, powerful hyperscale datacenters and connecting via nearly ubiquitous high performance wireless networks has changed and will disrupt major sectors of the world economy, creating new winners and punishing skeptical incumbents. The first wave has already hit media, advertising and retail, and the impacts on those businesses is far from over. Subsequent waves will affect many industries, including transportation, finance, and healthcare (Exhibit 10). Media and Advertising Relying on Amazon’s powerful AWS hosting platform and tinged with AI in its recommendations to its subscribers and its choices to develop original content, Netflix is an early child of the Cloud/AI era. So is Google’s YouTube – together, the two services deliver 37.5 billion hours of streaming video content to users per month. Add in Amazon Prime Video, Hulu, HBO-Now, and a host of wannabe streamers, and there is a substantial threat to linear PayTV. US viewership of traditional channelized TV stalled in 2011 and has been declining since 2015 (according to Nielsen figures that we believe are badly biased toward showing strong TV viewership). PayTV subs have been declining for 3 years on an accelerating curve, and ARPU growth has flattened. TV network ad sales have been surprisingly robust in the face of all this bad news, driven in part by increasing the ad minutes per hour of programming – a lever that we do not believe can continue to work. With the bad news on ratings and subscriptions continuing, the presumption that TV advertising is evergreen may prove as misguided as similar pronouncements about newspaper advertising more than a decade ago. We note that US newspaper ad sales formed a relative peak in 2006, more than a decade after circulation began its irreversible decline, before suffering a precipitous drop thereafter. Today, the digital ad market is dominated by Google and Facebook, which use AI to drive targeting and placement, as well as behavior tracing. With their enormous reach (more than a billion for many ad supported services) and superior platform capabilities, we expect this dominance to continue and perhaps, expand. We also note that digital advertising can address a much broader spending pool than just measured advertising – marketing, promotion and non-traditional ad spending are also affected (Exhibit 11). 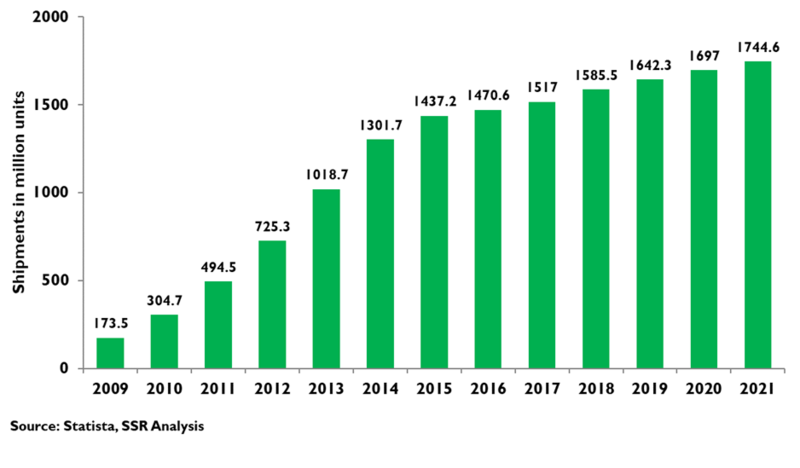 With this and the expected inflection point in TV spending, we believe that digital ads have plenty of runway to fuel growth, even though total global spending remains stable relative to the economy. Retail. The Amazon juggernaut has ravaged bookstores, department stores, big box electronics stores, office products stores, and has turned its attention to grocery with its take-out of Whole Foods (http://www.ssrllc.com/publication/quick-thoughts-amzn-wfm-synergies-and-options/). Rumors abound of a turn toward pharmacy and home improvement, and progress is slow and steady against the highly fragmented industrial distribution market. The impact is obvious to any investor in the sector. On-line retail is still just 8.4% of total spending in the US, and can likely continue to grow as delivery windows continue to shorten and shoppers get ever more comfortable with ordering via smartphone, tablet, PC or even a shout out to Alexa. Together, retail and wholesale distribution is a $10.5T business in the US alone, and likely $22.7T on a global basis. This is a very long runway. Few traditional retailers have been successful in this deluge – many that seemed positioned at the start have still suffered with time. We see only a glimmer of hope. First, we suspect that the rise of on-demand Transportation-as-a-Service could raise the appeal of destination shopping at physical stores able to deliver an entertaining or valuable experience bundled with the retail sale. Second, we expect a wave of retailers to finally realize that trying to build their own on-line presence in a world of giant platforms is a fool’s errand. Focusing on unique product selection, expert curation/recommendations, and other differentiators, retailers could turn to partner with platforms to aid in reach, discovery, logistics, delivery, payments, loyalty administration, and other scale reliant elements of the business system. We believe that many retailers will choose to work with Google, as Walmart recently did, perhaps muttering “The enemy of my enemy is my friend” under their breath. Consumer Electronics. The iPhone is one of the most influential consumer products of all time. It precipitated the annihilation of the prior cell phone industry – Nokia, Ericsson, Motorola, and Blackberry are essentially dead and gone. It crushed the ambitions of wireless carriers around the globe to hold on to their clumsily constructed walled gardens of content, and shifted competition away from “Can you hear me now?” to “Can I get good data throughput on my lunch hour?”. It spawned the iPad, which in turn forced Microsoft to reimagine Windows, and PC makers to radically rethink their form factors. This all happed really fast – we are only now seeing the introduction of the 10th anniversary iPhone. Now what? Globally, more than 2.75 billion users have smartphones. Total smartphone sales growth has slowed to a trickle with all the new demand coming at very low price-points in emerging markets (Exhibit 12). We don’t expect any reacceleration, as the best innovation will come on the cloud rather in the device. Adjunct devices – smart watches, home speakers, and the like – are very small markets relative to the smartphone, and while they will continue to grow nicely, they are not enough to drive the whole consumer electronics market forward. Eventually, we will have stylish AR glasses that will breakdown the cultural resistance the reduced the way-too-early Google Glass to a derisive meme, but the tech for that is YEARS away. We think the Cloud/AI Era will see the consumer electronics market spinning its wheels as cloud delivered, AI powered services soak up the attention and engagement. The App Model. Apps are a hallmark of the iPhone – branded shortcuts to device applications, to internet based services, or to content. A smartphone user, in trying to accomplish some task, must open the appropriate App and take it from there. The platform owner – Apple or Google – plays gatekeeper, demanding a tariff on business conducted via the apps. For users, this was a great advantage over the desktop model of opening a browser, then opening a tab to access a web site, which needed to behave according to the rules of the browser. For App publishers, it was a mixed blessing. On one hand, they got a direct connection to the user and could define the usage experience to their needs. On the other, they got to pay 30% of certain revenue streams to the platform owner. We believe that AI-powered virtual assistants are very likely to largely displace the user interface of most consumer devices and in the process, obviate the need for apps. Alexa users don’t open the “Philips Hue” App to dim their lights. Someday, Google Assistant will book flights and hotels based on your emailed itinerary, grab your preferred seats, check you in, download your boarding pass and bring it up when you walk to security – all without launching the Priceline, Expedia or United Airline Apps (Exhibit 13). 3rd party services will be somewhat commoditized in this scenario – a user will ask for a car and the assistant will choose the vendor based on preferences and price, removing Uber’s reach directly to the consumer. This is a powerful position for the platform, be it Apple’s Siri, Google’s Assistant, Amazon’s Alexa or Microsoft’s Cortana, and a terrible turn of events for the App economy. Enterprise IT. It has begun. The first wave was Software-as-a-Service, as pioneered by the quaintly named Saleforce.com back in the day. A company with a great application, like Salesforce’s CRM, could run it on a datacenter connected to the internet and all the customers could use it. This had a LOT of advantages for enterprises – lower costs, wider access, easier administration, etc. 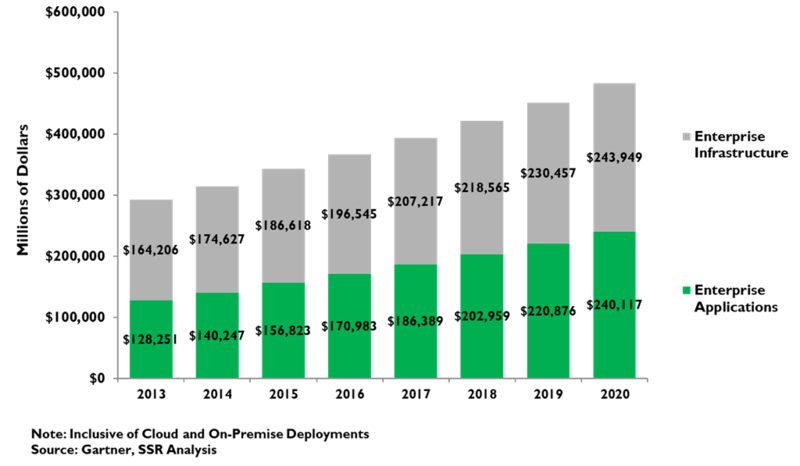 – and sales grew quickly. Others followed with their own best-of-breed SaaS applications – and so on, and so on, and so on. Cloud hosting began as a sideline for Amazon, which parlayed its investment in hyperscale datacenters for its own use into a massive growth business. The first, and still biggest, customers were web-based businesses, like Netflix, which saw the folly in throwing billions of dollars of capex into dedicated datacenters. Next came the developers, many from within corporate IT departments, grown tired of haggling with internal datacenter managers for more capacity and plunking down their credit cards for a bit of additional elbow room on AWS’s servers. 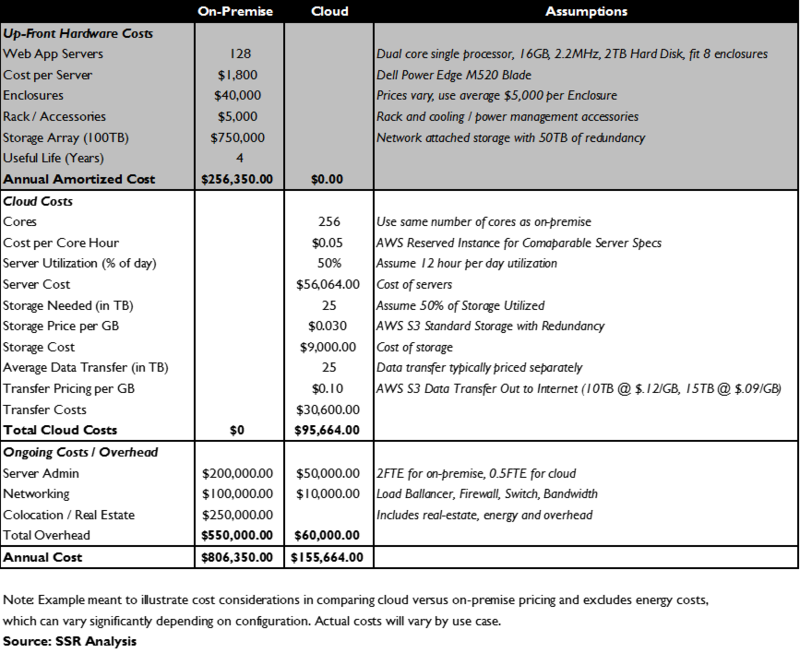 Hyperscale datacenters, with their rock-bottom operating expenses, their limitless scalability, and extraordinary utilization statistics, deliver computing at costs a magnitude lower than the typical enterprise datacenter (Exhibit 14, 15, 16). Even allowing for profit for Amazon, Microsoft or Google, this is a compelling advantage and we believe the gap is only widening. While there remain considerable switching barriers holding enterprises to their uncompetitive solutions, the erosion of those barriers – security concerns, non-standard customized applications, business disruptions during change over, etc. – is seeing a steady flow of more traditional enterprises shifting data processing jobs to the cloud. The transition to SaaS applications and the public cloud will play out over many, many years. We note that today, more than 50 years after the introduction of the groundbreaking System360, IBM still sells more than $5B in mainframe products and services each year. 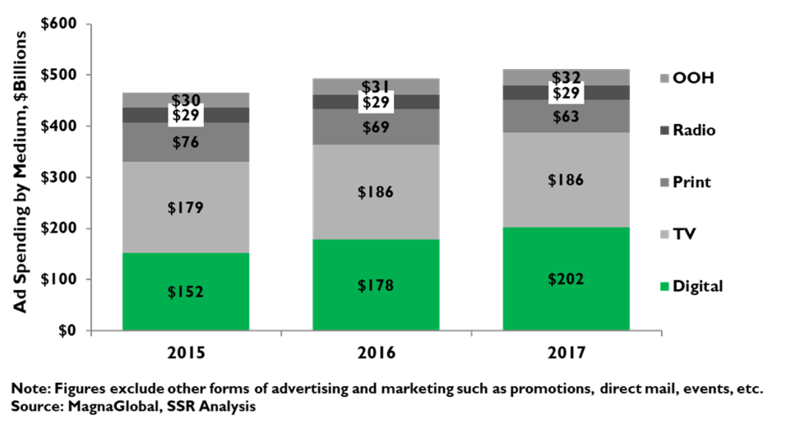 Still, the massive cloud opportunity – almost certainly deflationary to the $3-4T in total IT spending – will end up overwhelmingly benefiting the best players, while dooming the less visionary incumbents to a long-tail decline into eventual irrelevance. Transportation. We have written a lot about this, most recently our look at the various business roles required to deliver on-demand TaaS with autonomous vehicles (http://www.ssrllc.com/publication/self-driving-cars-building-a-team-to-bring-taas-to-market/). We are growing firmer in our conviction that the only company with sightlines to viable L5 full autonomy is Google’s Waymo (Exhibit 17)– news on would be competitors like Tesla, Apple and Uber has been quite discouraging (http://www.ssrllc.com/publication/quick-thoughts-news-shows-waymo-making-progress-while-rivals-flail/). Presuming that Waymo is technically ready to go by 2020, we would expect it to recruit an ecosystem of partners – its deal with Avis to support its Phoenix commercial trial is a very good start. Google would provide the autonomous tech and possibly, the logistics system for matching riders with cars, mapping routes and directing idle vehicles to high potential areas. It might also serve as the customer front end, reaching would-be subscribers through its franchise services and managing requests and inquiries, although there are others that might do that as well. Someone else who knows what they are doing and doesn’t mind holding tens of thousands of cabs on their balance sheet would certainly own the vehicles and maintain them. Fully autonomous service should launch in a market or two – municipalities willing to offer friendly regulation – operating with carefully chosen geographic boundaries, likely as a subscription service (for reasons we outline in the piece linked above.) We believe that the benefits to user and community will be very clear – e.g. safety, convenience, environmental impact, reduced burden on municipal services and facilities, lower transportation costs, etc. 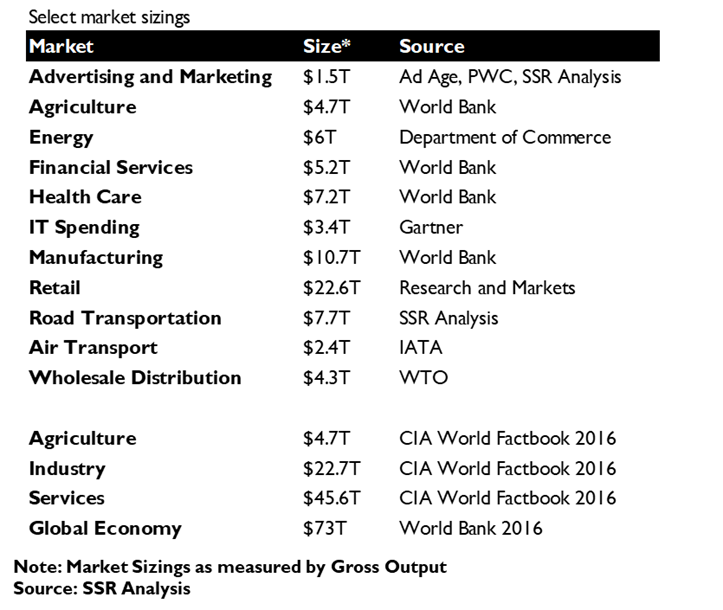 – and that new markets will quickly open to the fledgling service (Exhibit 18). The winners? Google, and possibly an also-ran or two in the self-driving technology race. Platform players who can incorporate travel on demand into the suite of services managed by their virtual assistants. Ecosystem partners, like Avis, for example, who fill in parts of the TaaS equation. Finally, consumers and municipalities. The losers? The traditional automobile ecosystem – i.e. car makers, suppliers, dealerships, repair shops, parts retailers, insurers, parking lot owners, service stations, etc. – will begin a very long and very slow bleed. People will be buying cars for a long time, but they will start buying fewer of them. On smaller volume and with a greater scrutiny of the externalities of car ownership, the costs of owning a car will start to go up, squeezing the market a bit further. We suspect it will begin to be noticeable within a decade. Consumer Finance. Biometric authentication sensors are becoming much cheaper and more commonplace. AI-based anti-fraud software can sift through enormous amounts of personal information to sniff out questionable transaction attempts much more quickly and accurately. AI-underwriting software can evaluate complex risk profiles with far more precision than previous systems, dramatically reducing the incidence of bad credit decisions. Blockchain technology provides an indelible record of transactions, establishing the provenance of assets with certainty – enabling radical new financial instruments like cryptocurrency, but also disrupting major aspects of managing other, more traditional assets (Exhibit 19). With these innovations, the incidence of fraud might drop to negligible levels with significant declines in credit risk, raising a serious question about the value proposition of traditional banking. Now financial systems sit safeguarded behind cautiously administered regulatory fences that respond begrudgingly to innovation, and banks may be able to protect their luxurious fee structure for years, but eventually, new entrants, armed with Cloud/AI Era technology, will press to offer much lower cost alternatives to traditional consumer financial services. The winners? Buyers and sellers of goods and services who will see the elimination of costs and friction in completing transactions. Dominant platform operators (by now, you know who they are) who will be able to fold in transactions and underwriting to the vast menu of services provided. 3rd parties who find ways to add real value in the new “low transaction risk” environment – possibly network brands like Visa, Mastercard or PayPal. The losers? Banks. Healthcare. If financial systems are protected by a thicket of regulation, healthcare has a forest. Still, the Cloud/AI Era offers enormous potential for advances in the efficacy and cost of the entire health system. AI software excels in finding relevant indicators from a massive ocean of data and building uncannily accurate predictive models from ambiguity. Throughout the treatment process – predicting disease outbreaks, triaging patients for treatment, interpreting medical tests, diagnosing maladies, optimizing treatment protocols, and defining effective preventative measures – AI could advance current standards and dramatically curtail costs, particularly with a growing worldwide shortage of doctors and other medical professionals. Networking advances and the proliferation of smartphones also make telemedicine ever more practical, while wearables with health monitoring capabilities could expand the potential of preventative care. AI could also accelerate drug discovery and testing, bringing safer and more effective medicines to market more quickly. We suspect that many of the most promising aspects of Cloud/AI infused healthcare will flourish in emerging markets first, where healthcare infrastructures are most strained and where regulatory barriers are the most fluid. Even there, data quality and fragmentation remain considerable issues that will take time to address. Advances in treatment outcomes in those arenas should eventually shake more developed markets from their sclerosis. It may be too early to pick winners and losers ahead of these changes, although there certainly will be both. However, we do expect the major platform players to play a role. Other Industries. Most other industries will feel the effects of the Cloud/AI Era, although we don’t yet see the case for comprehensive disruption (Exhibit 20). We see the potential for predictive analytic models to transform resource allocation and general decision processes – better identifying sales leads, increasing the utilization and up-time of machinery, maximizing efficiency and reducing input costs, and so on. It is easy to imagine industries from agriculture to energy taking advantage of these opportunities. Here the biggest obstacle is the availability and quality of data. We have written about these issues (http://www.ssrllc.com/publication/ai-data-food-for-artificial-thought/) – vetting and reformatting databases is a considerable first step. While we would not be looking for outsiders to displace incumbents in these industries, Cloud/AI solutions will certainly upset the competitive balance. Few of these companies will be able to attract experienced computer science talent to their organizations, so most will rely on partners to help them reimagine their industry-specific applications for the new ERA. AI hosting platforms from Amazon, Microsoft and Google will be excellent resources, but we believe more hands-on support will be vital. This is a substantial opportunity for IBM and its Watson AI initiative. We also expect new 3rd party IT services players with relevant skills in adapting AI to specific vertical industries to flourish. AI virtual assistants will be the primary UI – While the attention has been on the voice recognition and natural language interpretation aspects of virtual assistants, the contextual anticipation of needs may prove to be the bigger game changer (Exhibit 21). Future versions of Google Assistant, Alexa, Siri and Cortana will intuit forthcoming requests, and will draw input from voice and typed queries, from gestures and facial expressions, from calendars and messages, and from physical context. AI assistants will live in the cloud and will be able to securely interact with the user across many different access points with continuity, responding to ever more complex requests and managing the many 3rd parties that may play a role in fulfilling them. By 2027, we believe that AI assistants will be the primary interface for most users, with app engagement having begun a sharp decline years before (http://www.ssrllc.com/publication/ai-assistants-the-next-user-interface-paradigm/). Half of enterprise workloads will be in the public cloud – The substantial cost and performance advantages of public cloud platforms (Amazon AWS, Microsoft Azure, Google Cloud Platform, possibly IBM) are already clear, with data security increasingly viewed as an advantage rather than a risk (Exhibit 22). Tools to reduce transition costs are emerging, as are IT services providers with expertise in helping to define and manage “hybrid” operations as more and more workloads are moved to the cloud. Containerization, a technology to atomize computing tasks into small bits that can be spread to multiple datacenters will help enterprises maintain a measure of control over their cloud hosts, encouraging commoditization of basic compute/storage functions. Overall IT spending will fall, but hosting operations will grow dramatically. By 2027, we will be in the middle of the exodus. with AI for analytics and with AI assistant style UIs that tie together all of the different services. The platform providers will also help customers analyze the usage data of their employees, providing valuable insight into productivity. We expect this to be largely complete by 2027. Digital advertising will be mature- Total advertising spending, as a percentage of the GDP, has been famously stable for over 100 years. Right now, Google and Facebook are using their digital reach and sophisticated targeting and tracking abilities to make landgrabs from other categories of advertising and marketing spending. That will continue for a few years, with TV ad sales likely the next pot of gold. Still, with a finite pie, we expect digital gains to slow with time, and by 2027, the share is likely to be at an equilibrium. Google and Facebook are likely to be still dominant, although we wouldn’t be surprised to see Amazon and Netflix as scale players by 2027. Of these companies, Facebook has made the least effort to pursue growth opportunities in other areas. 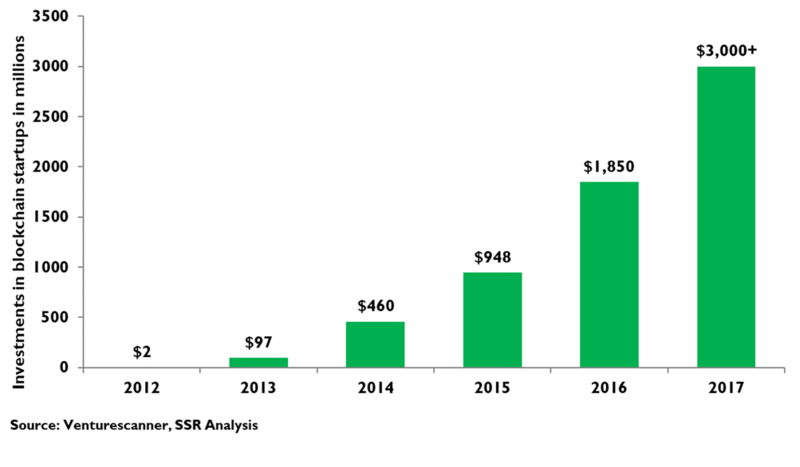 Global ecommerce will still be a double-digit growth market – US retail spending is a $10.5T piece of a $22.7T world-wide retail market. Business-to-business wholesale distribution is an even bigger addressable market. While ecommerce is already a more than $2T global business, it is still a small piece of the possible opportunity (Exhibit 23). By 2027, almost every category of retail shopping will have been disrupted badly, with Amazon the primary agent of destruction. However, we believe that there will still be plenty of runway left, particularly on the B2B side. Multiple cities will have fleets of commercial robo-cabs – We believe Waymo is close to achieving full L5 autonomy in its driverless cars, at least to the point that commercial service in a well-mapped and geofenced urban/suburban market will be viable within 2-3 years. By 2027, we expect alternative autonomous technology vendors (e.g. Uber and Baidu) could be ready to compete and that several cities will have active commercial TaaS operators, with many further markets preparing to authorize the same. Ecosystems of tech platforms, consumer platforms and fleet operators will combine to offer subscription services, defined to avoid rate arbitrage by AI assistants. The effect on demand for new private vehicles will begin to show. Cloud/AI Platforms will offer financial services – By 2027, Google, Amazon, Apple, and others MAY be allowed to offer consumer banking – e.g. deposits, payments, loans, etc. – with fee structures well below current levels. These platforms will use their extensive records of personal activity and biometric identifiers to nearly eliminate authentication risk, and will use AI to develop superior risk assessment models for underwriting insurance and writing loans. The primary question here is regulatory oversight. It is quite possible that developed market governments will not allow this change to happen in the next decade. Industrial handsfree AR will be well established, with consumer solutions just becoming viable- Current technology will not support lightweight, high quality alternative reality solutions (http://www.ssrllc.com/publication/vr-and-ar-the-reality-story/). AR displays able to interpolate digital content directly into users’ fields of view are bulky, expensive and require substantial processing power. Lighter, less expensive units, such as Google Glass, offer poor resolution and cannot connect digital content directly to the objects in the user’s field of view. We are also skeptical that smartphone-based AR solutions, such as Apple’s ARKit and Google’s ARCore, handhelds with limited processing power and field of view, will find mass market use cases – the widely shared furniture shopping solution does not seem a killer app. However, we do think that both bulky high-end AR headsets and low functioned heads-up displays will find high value use cases in industrial applications – $20K AR helmets for high tech repair technicians could dramatically improve results and productivity, while a heads-up display might help a doctor keep her eyes on the patient while also checking instrument readouts. These solutions will get better and better during the Cloud/AI era, and we expect, they will be an attractive and growing market for companies like Microsoft and Google. By 2027, with 5G wireless widely available, high quality AR glasses might by good enough, stylish enough and cheap big enough, for consumer solutions to begin to gain traction. AI healthcare will have shown its value in emerging markets – The barriers to adoption are considerable. Privacy policies leave much patient data inaccessible to AI models. Where it is not locked into secure patient records, it is usually fragmented across many organizations, with widely varying standards for storage. Those data records are usually locked into cumbersome structured databases, requiring reformatting and scrubbing for misfiled data. In many markets, strict regulations will make it difficult to gather and format enough appropriate data to feed AI models. These obstacles have already stymied attempts to build predictive models for cancer or establish reliable diagnostic tools. Still, the global shortage of health professionals and the pressure to contain healthcare costs could accelerate progress. We believe that lesser developed markets, where the talent shortage is most acute could be more hospitable to AI-powered healthcare delivery solutions. This could form the basis for similar systems to gain hold in more advanced markets. By 2027, we expect this dynamic to be clear with movement in many countries to reduce barriers and adopt Cloud/AI era healthcare solutions. Google, Amazon and Microsoft will win – The AI/Cloud Era will yield enormous scale and reach economies, which will favor platforms of massive hyperscale datacenters, sophisticated AI tools, and unique datasets (Exhibit 24). Opportunities in enterprise IT hosting, e-commerce, transportation, finance, healthcare and other industries will generate trillions of dollars for new business initiatives. Google, Amazon and Microsoft are at the center of all of it, with growing scale advantages and clear intentions for the emerging opportunities. Like the Mainframe Era and the PC Era, the Cloud/AI Era will not last forever, and the companies at the core will not be invulnerable if they ignore the inevitable next generational disruption. There are many nascent innovations that have the potential to catalyze a future paradigm shift. Quantum computing, which could dramatically increase the speed and complexity of processing, is not yet a commercially viable technology and will require significant development progress (Exhibit 25). For the moment, Google, IBM and Microsoft are leading the R&D charge along with academic researchers, but it is not yet clear which of several possible development paths will prove to be the most successful and there is possible, if not probable, that breakthroughs will come from yet to be acknowledged challengers. Other possible game changers: Atomic-level storage, by which a single atom might be able to store data in a stable state; Nano-bots, microscopic machines able to perform physical tasks have huge potential to change healthcare, manufacturing and other economic sectors; Superefficient solar cells could extract many times more energy than they currently do, taking the cost of power down by a step function; Unsupervised learning models could sharply accelerate the process of building useful AI software. There are others, and will be others that are not yet understood. Any of them could upset the status quo the next time around. We are confident that the paradigm shifts underway are comprehensive and irreversible, with clear implications for investors. As the scenario plays out, we see 8 major tenets for picking winners and avoiding losers. Trust the top platforms – We believe that Google, Amazon and Microsoft are the best positioned companies in the Cloud/AI Era. All three have runway to continue growing and surprise against expectations. In our scenario, these are three most valuable companies a decade from now. Their biggest vulnerabilities will be from legal and regulatory actions. Ride franchises – Companies with sizeable cloud/AI business franchises, competitive moats, and no obvious vulnerabilities to direct competition from the top platforms should be able to sustain strong momentum. Here our primary concern would be the growth runway for the specific franchises and the potential for competition from the platforms. Companies like Facebook, Netflix, and even Salesforce fit this category. Expect consolidation – Fragmented markets in enterprise SaaS software, semiconductors, and digital media will see further consolidation. We expect industry M&A to pick-up and buying baskets of high potential targets will likely be a fruitful strategy. Look for complementary tech – Enabling innovations, like 5G technology, AI-friendly parallel processors, sensors, blockchain, etc., are substantial opportunities. Names like Qualcomm, Keysight, Nvidia, Xilinx, and others make sense now, and more will emerge with time. Consider ecosystem partners – The beneficiaries of the Cloud/AI Era will not all be technology leaders. We see opportunity in more far afield areas like rental car companies, credit card networks and fiber network operators. Incumbents ONLY if they challenge the status quo – We are generally skeptical of the companies in the industries threatened by paradigm change. Still, history suggests that some will survive, and perhaps, thrive from the change. We have been intrigued by IBM, and there are certainly others. franchises. We advise vetting new companies against the first six tenets and with an open eye to long term competitive threats. Worry about the government – The powerful platforms and franchises at the core of the generational change have already drawn notice from regulators and legal systems in jurisdictions around the world. Anti-trust, privacy, patent, taxation and other issues have substantial potential threat. These tenets are reflected in our model portfolio, which we update on a quarterly basis (Exhibit 26 & 27). These 15 stocks are intended to be representative of the many themes that run through our research and have formed the basis of our overarching thesis of paradigm change. Over the past few years, our relative performance has been strong, and we remain confident in these recommendations.